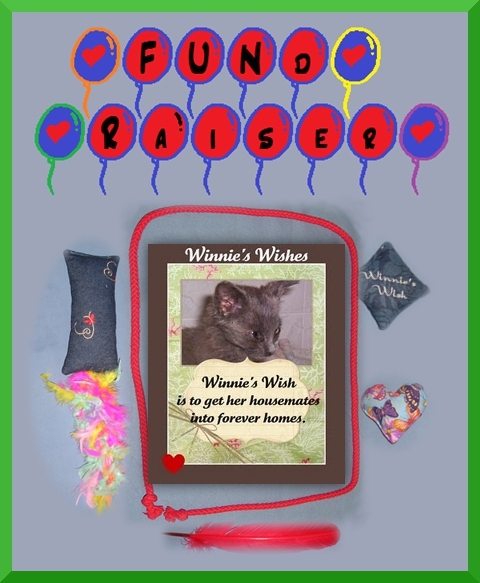 Celestial Kitties: FUN FUN FUNdraiser!! And really nice toys, too. OMC, this is an awesome idea! What a wonderful idea to cap off Leo's fantastic birthday party yesterday! That really is wonderful! I am going to.have my Dad donate for 2 toys, but please send them to go home with the next two adoptees. That is such a good idea. Wish we had some green papers to help. But we hope it is a huge success. Take care. Whoa! That peather looks pawsome. I'll see if Pop can help. our taxes are due so he might not be able to. Definently borrowing your post and the pictures from Chrystal's to get more bloggers the news about your awesome FUNdraiser! Our #1 is currently in PEI, canada, and was wondering what the price would be to ship a package there? We think this is a very good idea! We hope you will make lots of paper monies with your fundraiser. Thank you all so much! I will check on mail to PEI right away! We will work on Momma!!! What a great idea!!! Love the toys. Wow!! What a great way to raise some green papers for Chrystal!! Andrea, this is really, really wonderful. You are such a great friend to Chrystal and to cats everywhere. THANK YOU for all you do! Wooo! Hoo! This is way too cool! Yous guys rocks! You guys are the best for raising money for the place that saved Leo! Those are such wonderful toys, specially the feather ones! Woo, how cool is that!! Wonderful idea! Great idea! We are IN as our Pops gave us an advance on our allowance. Purrs to all those in need!